Grand Theft Auto V is another installment in one of the most popular series in the history of video games. The game was released initially on Xbox 360 and PlayStation 3 in 2013. 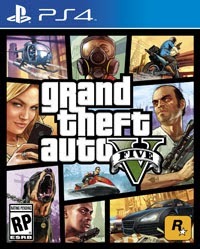 Version for PlayStation 4 is an expanded and improved edition of the original title. It offers full support for high screen resolutions. Textures and three-dimensional models are in higher quality. The game world is more living thanks to increased number of cars in traffic and pedestrians. Lighting system, car damages and weather also received improvements. There are also new missions, weapons, vehicles and options of characters customization. Developers had in mind players who earlier bought GTA V for PlayStation 3 – they can transfer their save files and characters from GTA Online to newer version of the game. The main metropolis of Grand Theft Auto V – Los Santos – and its diverse surroundings (mountains, deserts, cliffs, fields, valleys, military bases and even the coastal zone of the city with submarine canyons and coral reefs) are the largest world ever created by the Rockstar North developers. It is the outcome of countless expeditions mixed with statistical data on the California population. Therefore, almost each element of the city seems very natural – from the behavior patterns of individual pedestrians, to the most popular vehicles found on the streets and traffic management system. The exploration of the world presented in Grand Theft Auto V is spiced with mini-games (tennis, yoga, golf etc. ), but the core are the missions during which you control one, two or even three characters. Usually, your missions focus on robbing a bank or a shop, however there are also random missions triggered in various locations. Some of them relate to the characters’ friends or members of their families, thus exploring their personal stories. Michael has to solve family problems with his wife Amanda and children (Tracy and Jimmy), Trevor wanders around with Ron, who sees conspiracy theories everywhere, while Franklin has to deal with his crazy friends, e.g. Lamar. The creators offer you numerous vehicles – from bicycles to water scooters, airplanes and helicopters. The car driving mechanism has been improved and now resembles these found in racing games. Again, the game features Ammu-Nation weapon chain store. Moreover, melee skills gain in importance. The developers decided to return to the mechanism that modifies character stats, i.e. use certain skills (e.g. shooting or driving vehicles) to master them. You can collect money to spend it on equipment, clothes, cars, yachts and even real estate. An interesting improvement of the economic system is stock market which is even featured in several story missions. When it comes to the audiovisual layer, the game offers a dynamic soundtrack perfectly adapting to the pace of on- screen events. The graphics is based on a modified version of the engine created by Rockstar Games, i.e. RAGE (Rockstar Advanced Game Engine). It enables rendering large areas of the game world and features advanced system of shading and lighting simulation. GTA V offers extensive gaming network called GTA Online. In multiplayer mode players create their characters and level them up by completing missions or minor challenges – gang wars, racing or parachuting. 16 people can take part in a single game session playing in one world. Players can fight with each other, organize attacks or take various tasks (these events are for 2-10 people). Grand Theft Auto V PS4 players' expectations: 7.9 / 10 calculated from 573 players' votes.